SEOUL, South Korea — Divided for seven decades, North and South Korea together won their first international recognition of Korean traditional wrestling on Monday. The Koreas had earlier pushed separate bids for the sport's UNESCO recognition before merging their applications amid an easing of tensions this year. Local media reports said South Korea had first proposed the joint bid during a leaders' summit at a Korean border village in April. On Monday, the Intergovernmental Committee for the Safeguarding of the Intangible Cultural Heritage, meeting in Port Louis, decided to inscribe traditional Korean wrestling on its list of "Intangible Cultural Heritage of Humanity" on the basis of an application by the two Koreas, UNESCO said in a release. "The joint inscription marks a highly symbolic step on the road to inter-Korean reconciliation," UNESCO director-general Audrey Azoulay said. "It reminds us of the peace-building power of cultural heritage, as a bridge between peoples. This marks a victory for the longstanding and profound ties between both sides of the inter-Korean border." South Korea's Cultural Heritage Administration welcomed the decision, saying it will provide the two Koreas with a new opportunity to further promote exchanges in the field of cultural heritage. It also said the joint nomination is the "fruitful outcome of a meeting" between South Korean President Moon Jae-in and Azoulay in October. UNESCO said during that meeting with Moon, Azoulay proposed a series of concrete projects involving UNESCO that would facilitate inter-Korean reconciliation. It said similar discussions also took place with North Korea in recent weeks. "The commitment of UNESCO to facilitate peace between the two parties has led to the joint inscription in a short timeframe," it said. The Koreas saw their ties improved greatly since North Korean leader Kim Jong Un reached out to Moon and U.S. President Donald Trump with a vague nuclear disarmament commitment early this year. They have since marched together during the opening ceremony of the Olympics, exchanged pop singer performances and taken steps toward easing a frontline military standoff. But it's unclear how far their reconciliation moves would go as U.S.-led diplomacy aimed at stripping North Korea of its nuclear program has reported headway since Kim's summit with Trump in June. The Koreas were a single country before their separation in 1945. Split along the world's most heavily fortified border, the countries now have linguistic, cultural and other gaps. They use different English Romanization rules. The wrestling's English spelling is "ssirum" in North Korea and "ssireum" in South Korea. The Koreas use both spellings for their combined bid for UNESCO recognition. North Korea has won UNESCO recognitions of two Korean cultural assets — the Korean folk tune "Airrang" and the making of Kimchi. The two are among the 19 items that South Korea has received UNESCO recognition for, according to South Korean officials. 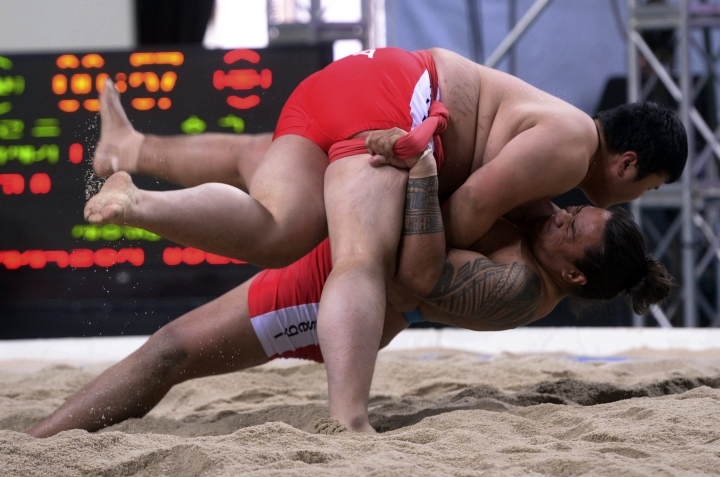 Korean wresting is a national sport and a popular cultural practice in both Koreas. In the sport, participants with a belt around their waists and thighs use their hands, legs and other body parts to bring down their opponents. In South Korea, it gained wide popularity in the 1980s, threatening the long-running popularity of baseball and soccer.